A woman who found out her husband had been cheating using popular 'dating' site Tinder, felt she needed to get revenge by making a few small changes to his profile. In a move which has prompted a lot of debate on Reddit regarding phone privacy, the woman decided to lay a little truth upon the women her husband had been trying to attract. 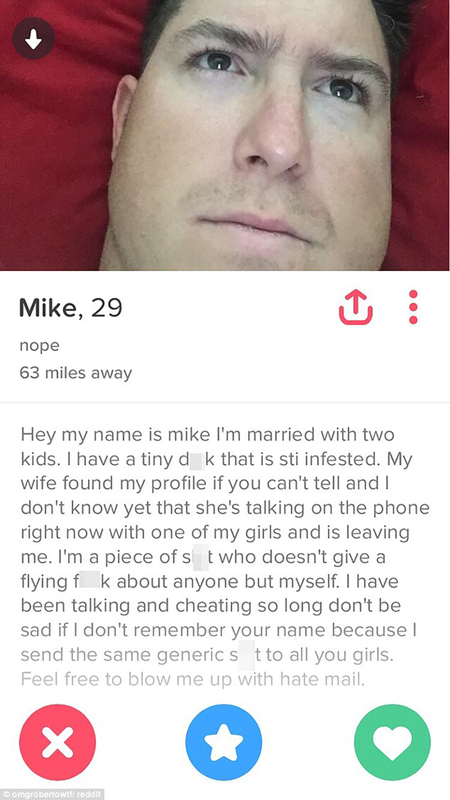 We do not know the wifes name, but her husband is called 'Mike'. Those first two sentences would put anyone off straight away, but she felt the need to go on more. She specifically pointed out that she has been talking to a lot of the women he has already had contact with. She also changed his picture to be a very unflattering one. She had completely humiliated him and encouraged women to send him hate mail. Big mistake, Mike. But we can all agree that you deserve it.